Founded in 2005 by and at the Goethe-Institut under the playful moniker “Eh! U Meet the Europeans” as a celebration of a diverse but joint cultural expression, the EUFF kicked off with an ambitious and enthusiastic program of 15 participating countries. In the first edition, Germany presented HEAD-ON by Fatih Akin, Austria participated with DOG DAYS by Ulrich Seidl – all came together to reflect the excellence, innovation, and boundless aesthetics of European cinema, to offer Toronto audiences a wider selection of cinematic styles, and to strengthen European-Canadian cultural dialogue and exchange. Quickly, the popular festival outgrew the Goethe-Institut's in-house screening room and reacted to the rapid expansion of the European Union. Today, for two busy weeks each November at Toronto's Royal Cinema, all 28 member states participate in the festival and present the best cinema their countries have to offer, from dramas to comedies, from feature films to docs. Each year the festival visitors have the opportunity to vote for their favourite film. The Goethe-Institut’s film selection has won the EUFF Audience Award twice: 2011 with game-changing migration comedy ALMANYA – WELCOME TO GERMANY by Yasemin Şamdereli, and in 2016 with Til Schweiger’s tragicomedy HEAD FULL OF HONEY which tackles dementia and modern family dynamics. Other German award-winning films shown at the festival were Andreas Dresen’s STOPPED ON TRACK as well as THE BAADER MEINHOF COMPLEX, often as Canadian or Toronto premieres. In 2010, the screening of the English-language drama STORM by Hans-Christian Schmid, starring European all-star cast Kerry Fox, Alexander Fehling, and Rolf Lassgård, was accompanied by a panel discussion about human rights, bringing Canadian philosopher Mark Kingwell and German human rights lawyer Mirja Trilsch to the stage of the Royal. Montreal-based Trilsch worked at The International Criminal Tribunal for the former Yugoslavia at The Hague – in the actual role portrayed by Fehling in the film. 2014 marked the 25th anniversary of the fall of the Berlin wall, which the Goethe-Institut marked with Christian Schwochow’s critical refugee drama WEST, introduced by the former director of the Stasi Archives Mecklenburg-Vorpommern, GDR dissident Jörn Mothes, who also took part in a debate on “Europe 25 years after the fall of the Berlin Wall” at the Munk School of Global Affairs. 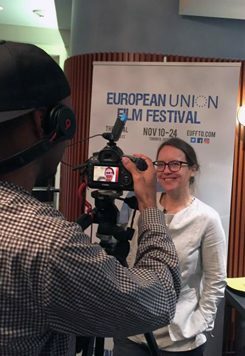 For Canadians, the festival offers a unique chance to join a community of curious cineastes and to see outstanding European movies, which are often not screened by commercial cinemas. The EUFF is funded and organized by the European cultural institutes and consulates. The festival executive continues to innovate, including accompanying exhibitions like “Fassbinder 1945 – 1982” at the Goethe-Institut in 2016. Select screenings are preceded by international shorts and introduced by Canadian film students. Another recent, year-round initiative is the EUFF Classics Series, complementing the EUFF’s program of diverse contemporary film by showcasing canonized European films, whether France’s JOUR DE FETE or Italy’s JOURNEY TO ITALY. Germany presents Wolfgang Becker’s GOOD BYE, LENIN!, the quintessential hit comedy that defined the coming together of a nation after 1989 and launched 25-year old Daniel Brühl’s international career, in the inaugural Classics year. Watch the best @EUFFTO, from Austria, Belgium, Bulgaria, Croatia, Cyprus, Czech Republic, Denmark, Estonia, Finland, France, Germany, Greece, Hungary, Ireland, Italy, Latvia, Lithuania, Luxembourg, Malta, The Netherlands, Poland, Portugal, Romania, Slovakia, Slovenia, Spain, Sweden, United Kingdom.